The EUR/JPY chart shows that this pair is in a strong down trend on the largest time frames, like the MN time frame shown below. Below the current pricing, this pair has some minor support levels down to the 126.00 area, but below that price it has substantial pip potential. Most or all of the JPY pairs are also in long term down trends, indicating across the board JPY (Japanese Yen) strength. This analysis of the EUR/JPY was done with multiple time frame analysis by individual currency, attached to a set of meta trader charts. These are 5/12 exponential moving averages. 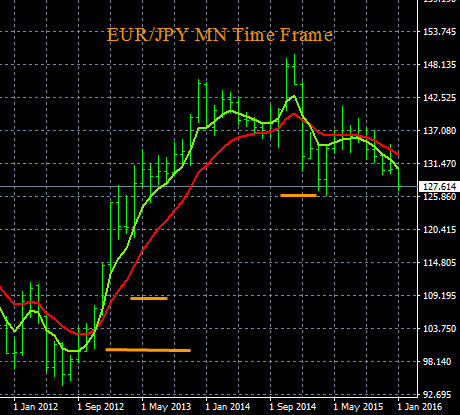 Today in forex trading the EUR/JPY had a buy signal on The Forex Heatmap®. The Japanese Yen (JPY) was weak on all pairs, driving strong movement. There was also some minor Euro (EUR), Canadian Dollar (CAD) and Australian Dollar (AUD) strength in the market today. This drove the EUR/JPY, CAD/JPY and AUD/JPY higher. The CAD/JPY is forming a new up trend on the D1 time frame and should continue much higher. The EUR/JPY is at resistance at 137.00, and the AUD/JPY should continue upward to the next resistance level at 95.50. The trades and signals you see below are from The Forex Heatmap®, which provides live buy and sell signals for 28 pairs including the JPY pairs. Today in forex trades the GBP/JPY had a clear buy signal. The D1 trend is forming to the upside on this pair and it could continue up to the 172.75 resistance area. So it has ongoing potential and we will continue to set additional buy plans on this pair. Other Japanese Yen (JPY) pairs like the EUR/JPY also moved higher, and this pair is also trending to the upside. The live trade signals you see below are from The Forex Heatmap®, showing the British Pound (GBP) strength and the JPY weakness. Today after the Euro (EUR) Consumer Price Index (CPI) news announcement, the Euro and Swiss Franc (CHF) both strengthened. The Euro CPI is the change in the price of goods and services purchased by consumers, it came in at 0.8% actual versus 0.7% forecast. 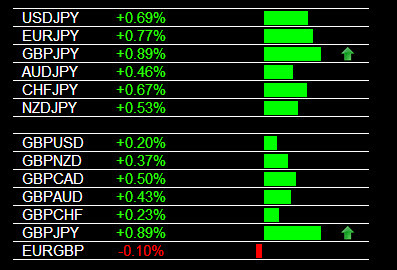 The JPY (Japanese Yen) was also weak, so the CHF/JPY and EUR/JPY moved much higher after the news. These movements were strong were on these pairs, but these were short term intra-day movements on these two pairs. The EUR strength also caused the EUR/AUD to break out of resistance to the upside, and this pair is now trending up on the D1 time frame. 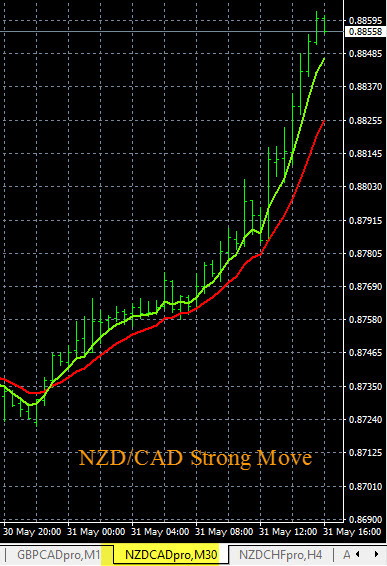 We will continue to issue new trading plans on the EUR/AUD and monitor this new uptrend. 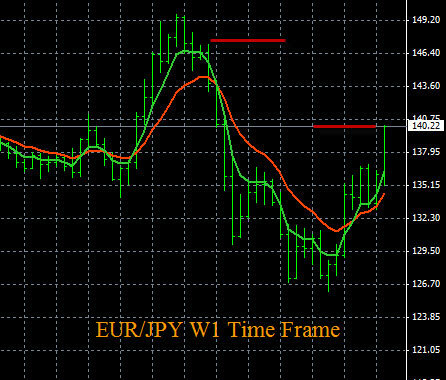 The EUR strength and JPY weakness you see below is on The Forex Heatmap®, which gives live trading signals for 28 pairs. It works well to provide trade entries after news drivers like consumer price index, or any other major news drivers. Today in the currency markets the EUR (Euro) was weak on all pairs and some of the price movements were very strong. This provided excellent trading opportunities selling the EUR pairs for traders. 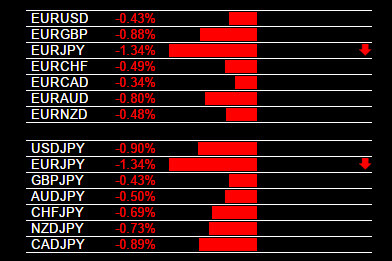 Pairs like the EUR/JPY and EUR/CAD sold off strong to the downside. These pairs should continue lower for at least another day to our target support levels. For our specific price targets and support levels check our daily forex trading plans. The trading signals you see below are from The Forex Heatmap®, a real time visual map of the currency market, it works for 28 pairs including the seven EUR pairs you see below. Our currency trading signals are obvious, unlike the complicated technical indicators you see most forex traders using. Our signals are logical and can result in consistent profitable trade entries week after week. If you want to use our logical forex trading system check our our website and ask us questions, we are happy to help.